If you have been operating a powered industrial truck at work or maybe on a voluntary basis for a charitable organization, you’ve already done the hard part toward getting a forklift certification. Becoming certified, and OSHA compliant, takes less than half a day of your time and could end up getting you a better-paying job. Not only that, but if you have a forklift certification, you could probably find work anywhere in the world. Can you think of anywhere in the world where goods don’t need to be shifted from dockside to ships or vice versa, or from one end of a warehouse or a building site to another? Exactly. Getting a forklift certification is your passport to anywhere. CertifyMe can help you cut your forklift training time in half and save you money while still managing to achieve a standard of excellence. Forklift certification is a two-phase process. The first phase is classroom training. With CertifyMe, this is done online. You will be trained in all of the topics required by OSHA. After you have completed the training and when you are ready, the next step is to take an online test. This takes less than two hours. Your employer is required by law to conduct and document a hands-on evaluation of your ability. The reason it has to be completed by your employer is because the examination needs to be based on the workplace itself and the equipment you will be using while operating there. When should you get forklift certification? That should be obvious. 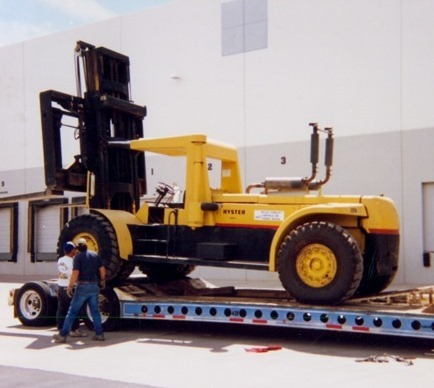 If you already know how to operate a forklift, are competent and need to be OSHA compliant, the time to train is NOW. Contact us.